The Regidor (Treasury Accountant) had complained constantly like a broken record to the Governor General of the impossibility of fulfilling his tax-collecting task due to the liquidity of naming conditions in the whole archipelago...because of three anomalies. Second, the traditional practice was to be named as the grandson of so and so, as in Apo ni Tuliao or Apo ni Lagmay...If the grandfather died, the name changed to the father’s name as in Anak ni Batak, or Anak ni Tasyo. Third, if the person had a unique characteristic, his name was a physical description of his/her person. Cross-eyed Juan was called Juang Duling. A satirical ridicule happened when a very bald guy was called Kulot (Curly). With this in mind, Governor General Narciso Claveria asked Madrid for a list of names to be given out to the colonial subjects in the Philippines. Madrid collected all the names in all the provinces of Spain. 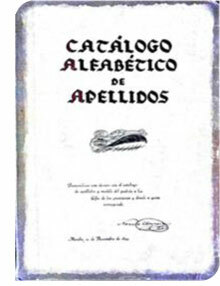 It was called Catalogo de Apellidos. Claveria thought: "If I can standardize all the surnames in the Philippines, I can trace all the family tributes and personal taxes of every single one."